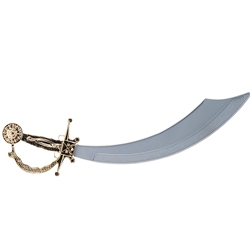 Pirate Cutlass. Made of hard plastic. A simple but effective sword with a blade and handle. Great for "Pirates of Penzance", "Peter Pan", "King and I", "Kismet", "Aladdin" and many other productions. Blade measures 14" with a 5" hilt for a total of 19" in length.